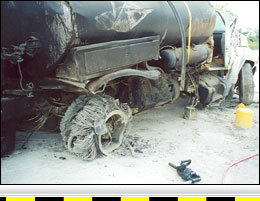 Crash Forensics provides complete failure analysis and testing services for vehicles, their parts, and equipment. Testing and failure analysis services can be conducted on site from our mobile lab or in-house in our automotive lab. Our mobile lab is a Class 6 International truck fully equipped with all the necessary tools and test equipment allowing us to inspect and test anything related to vehicles. We are sensitive to concerns that the vehicles post-crash condition could be altered during testing. Therefore, the testing we perform is structured in a way that allows us to obtain results without altering the condition of the suspect system. Below is a brief discussion of mechanical failure analysis. Link to our automotive expert. 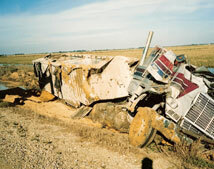 Vehicles after a crash are rarely found to have all their parts undamaged or unbroken. A good example of this is tires that are often damaged in all collisions. All crashes usually have at least four tires involved and more typically eight or more. 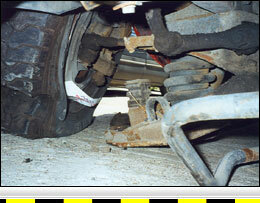 Therefore, there is a high probability that at least one tire will be flat when the vehicles are inspected. The mere presence of a flat tire is obviously not evidence of a failure. However, the cavalier investigator can arrive at this conclusion often ignoring overwhelming evidence to the contrary. 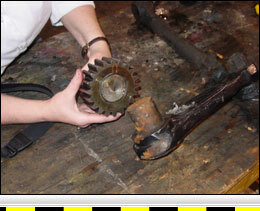 For this reason, extra caution is in order when analyzing mechanical failures to avoid hasty conclusions. A skilled failure analyst methodically and meticulously searches for and collects evidence then analyzes, tests, and compares all evidence and never arrives at a conclusion until the analysis is complete and no conflicting evidence is found. The investigation and analysis of motor-vehicle mechanical failures is essentially the combination of two disciplines, crash reconstruction and automotive technology. A true failure analyst should have knowledge and training in both these areas. The application of crash reconstruction principles are very important part of analyzing motor vehicle failures. The interpretation and analysis of physical evidence to determine what the vehicles did during a crash sequence is one of the basic parts of crash reconstruction. When analyzing mechanical failures, knowing how to interpret the physical evidence and determine if it is consistent with a mechanical failure is very important. Equally important is a detailed understanding of the design, construction, service, and maintenance of motor vehicles. Additionally, appropriate experience and skill is needed to disassemble vehicle components for inspection without causing any damage. A failure analysis should accomplish two primary goals. The first goal is to determine if a component found to be broken did or did not cause the crash. This part often relies heavily on roadway evidence and the application of reconstruction principles. For example, in a very simple case where a wheel is alleged to have come off a vehicle, an inspection of the roadway evidence may show very clearly that the corresponding tire left a skid mark leading into a collision with another vehicle. 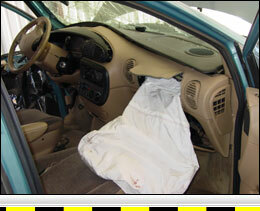 Under these circumstances, a conclusion that the wheel was on the vehicle before impact is clear. A second goal is to determine the cause of an identified failure. This relies more on the inspections and testing of the suspect parts, the history of the vehicle, and how it was operated.